Happy Wednesday all! That means we have a new challenge up at Penny’s this week! As always our challenges are anything goes..this week’s sponsor is Bugaboo Stamps! The winner is going to get 4 free images of their choice. 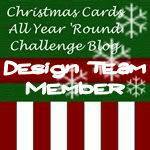 The DT got to play with some fun Christmas digis this week…here’s my card for you! I just used some Christmas DP from my stash. I used a sketch from Mojo Monday (#479). I just added a few star sequins and star bling. I hope you enjoy it and please stop by the blog to play along with us! Previous Post It’s Friday Friday….